The NOMAD Pro 2 will stand up to repetitive antiseptic and cross-contamination control. In a digital world, the NOMAD Pro 2 is specifically designed for digital sensors, although it works just as well with phosphor plates and traditional film as well. The dental team will appreciate how quickly and easily settings can be changed for different types of shots. Technical Specification: Battery Lithium Polymer, 22.2V, 1.25 Ahr Anode voltage 60 kV true DC Anode current 2.5 mA Exposure time range 0.02 – 1.00 s Focal spot 0.4 mm Quality Equivalent Filtration >1.5 mm Al Source to skin distance 20 cm X-ray field 60 mm round Maximum duty cycle 1:60 Total weight 5.5 lbs. (2.5 kg) NOMAD Pro 2 – Modern Radiation Shielding :- The external backscatter shield and internal radiation shielding are specially designed to protect the operator from radiation exposure. In fact, the exposure from using the NOMAD Pro 2 is less than one percent of allowed occupational doses. NOMAD Pro 2 – Digital Sensors or Film :- Whether you use the latest digital sensors, dental film, or phosphor plates, the NOMAD Pro 2 will produce high-quality diagnostic images. NOMAD Pro 2 – Time Savings :- The NOMAD Pro 2 color LCD user interface, simple touch controls and handheld design save time for the operator and patient. Handheld design allows operator to stay with patient, thereby reducing time required for X-ray procedures Simple controls built-in for quick adjustment of exposure time Custom exposure settings may be saved for fast recall Icons quickly identify tooth, receptor and patient type NOMAD Pro 2 – Clear Images :- The NOMAD Pro 2 produces the highest quality images. 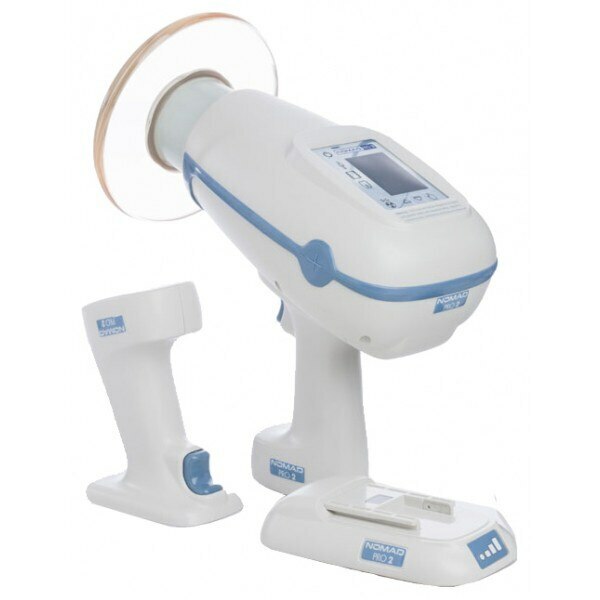 : • No blur from hand movement • 0.4 mm focal spot produces sharp, high resolution images • High-frequency, 60kV DC X-ray generator produces clear images while reducing patient dose NOMAD Pro 2 – Long Battery Life :- Hundreds of images can be obtained from one battery charge. The battery is incorporated into the handle, which is easily removed for charging. A battery icon on the LCD user interface displays current battery levels and indicates when it needs to be charged. The NOMAD Pro 2 system comes with two battery handles and a charging cradle to always ensure a charged battery.